Prepare for a fabulous evening of fine dining and classic variety presented with a whole new twist. Cirque, comedy, magic and music come together to create an immersive, theatrical performance. 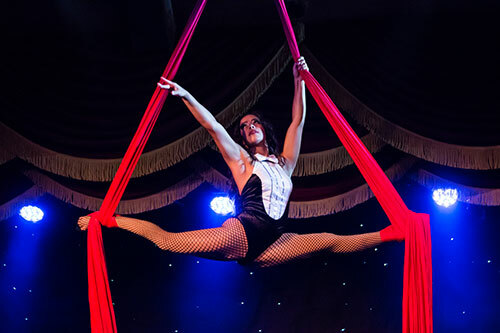 We’ve gathered together the finest entertainers, world-class chefs, bartenders and performers to entertain and captivate you for a fabulous evening you’ll never forget! With a rotating cast of some of the world’s top variety artists, you’ll want to come back! You’ll witness acts that you’ve seen on America’s Got Talent, Penn & Teller’s Fool Us, Masters of Illusion, the Late Show with David Letterman, The Tonight Show and more! You don’t want to miss Orange County’s most unique adult dining experience filled with non-stop comedy, daring acrobatics, live music, spectacular dancing and impossible feats! Whether it’s date night, a night out with friends, or a company party, you’re sure to enjoy this one of a kind show and mouthwatering five-course meal! Join the mayhem and discover what makes Teatro Martini the hottest spot in town every Friday at 8PM and Saturday at 9PM. For further information, visit www.TeatroMartini.com or call 1-844-249-7865. 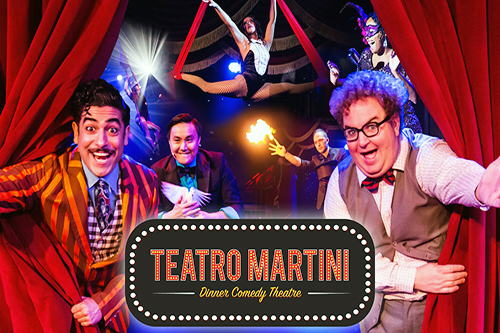 Teatro Martini encourages guests to don their best, and prepare for an evening that will not disappoint. Our dress code is an elegant casual; jackets recommended for men; ties are optional. Please no denim, no shorts, no flip flops or tennis shoes. Must be 21 and over to drink. 18 and older to enter. Valid for one Adult (18 years & over). ID Required. Includes 2-Hour Show and 4-Course Dinner on a Friday or Saturday Evening. Valid through 12/30/2019, except not valid on New Year’s Eve or Valentine’s Day. Includes tax. Reservations required, call 844-249-7865.